If you haven't already purchased PokerTracker, don't forget you can get PokerTracker for FREE from PokerSource. Just sign up for an online poker room and get a free copy of PokerTracker. We'll email you the license number after you complete the requirements any qualifying online poker room. Sign up for Free PokerTracker today! If you already have PokerTracker, then try one of our other promotions such as our free poker chips promotion. Wouldn't it be great if we could remember every move we ever made in every hand of poker we've played, so that we could dig out all of our mistakes and correct them? Wouldn't it be even better if we could remember all the plays our opponents have made against us so we could find their mistakes and exploit them? You don't need a photographic memory to do all these things. All you need is PokerTracker. PokerTracker has so much functionality that it often intimidates new users. There are many tabs and tables with loads of information and acronyms that make little sense at first glance. Hopefully these tables and acronyms will make more sense to you so you can separate the more important information from the less important details. PokerTracker performs two separate and equally useful functions. It allows you to evaluate your own play, and permits you to evaluate the play of your opponents. First we will look at how Poker Tracker can help you evaluate your own play, hopefully showing you holes in your game you can work to improve in future play. Most players are results oriented. If they won money they feel like they played well. If they lost money, they either played poorly, or even more likely, they feel like they "got unlucky." Effectively using PokerTracker can help determine if any or all of these possibilities are true or false. Click the Configure button and set the path to your Party Poker or skins’s Hand History directory. 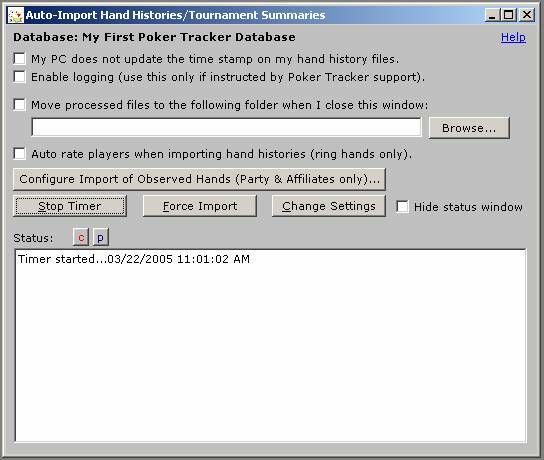 Be sure to add the Hand History directories for all Party Poker skins you use. Then click OK. This dialog will allow you to import hand histories as they occur. Once your hand histories have been imported, click on the “Ring Game” button to bring up the statistics captured for your ring game play. A player may want to evaluate his game as a whole, so he would want to review all of his hand histories. If he wanted to evaluate a single session or a group of sessions, he would want to evaluate a range of dates. These are all possible in Poker Tracker by using the "Preferences" tab, and selecting "Specific Date" or "Since a Date" or "Between Dates." If you select "Specific Date" PokerTracker will default to the current date. If you select "Since a Date" PokerTracker will default to the first day of the current month. Once a player has selected the sessions he wishes to evaluate, he can pick the specific hands that most require evaluation, namely the ones in which he lost the most money. By selecting the "Game Notes" tab and sorting the table by the "Net" column header in descending order, he will have a list of hands where the most money was won or the most money was lost. Evaluating individual mistakes in individual hands can help a player notice patterns of incorrect play that he can correct them, plugging leaks that can improve profitability. What PokerTracker does best is identify specific hands that the player most often plays incorrectly, so that when the player encounters these hands in the future he can adjust his play. The player can keep notes in the "Game Notes" window in the lower right hand corner of the Playback screen. Hopefully by evaluating hands where the most money was lost, a player can identify common plays that ended poorly. If the same play costs you money over and over, you can attempt to avoid that play in the future. Especially helpful in the "Playback This Hand" feature is the "Win%" function. This will tell the player what the percentage chance of winning the hand was, and he can more easily determine if his call had the appropriate pot odds to make a certain play. If you find yourself commonly trying to make draws when the pot odds make it a poor decision, a player may need to slow down and more closely evaluate pot odds before he makes a play. Another very important factor in becoming a successful player is pre-flop hand selection. What hands a player elects to play and what position those particular hands are played from has a great deal of effect on the success or failure of a player. These statistics must be evaluated over a long period of time; hopefully several thousands of hands can be evaluated. The amount of data a player has to evaluate greatly determines how helpful that data can be. Individual starting hands are displayed in the "General Info" tab. A player can click on the "Net" or "BB/hand" column heading to sort the table and see what hands he most often loses money with, or loses the most money with. 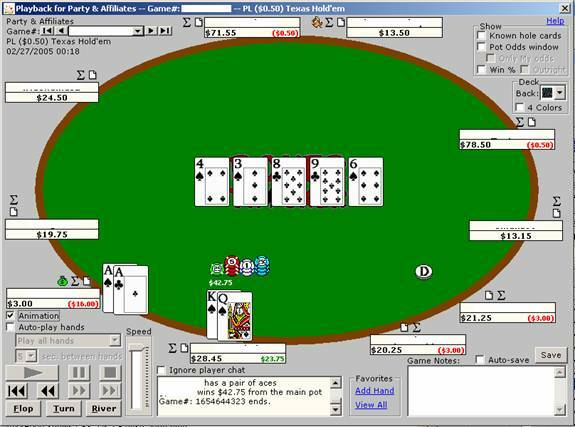 These results can be further refined by selecting the "Filters" button, where the player can select specific hands where he limped into hands, called raises or played from the blinds. If you are calling too many raises pre-flop with weak starting hands, you can find this by evaluating just those hands. A player can also evaluate how he plays different hands from different positions by utilizing the "Positions Stats" tab. Position is an extremely important factor in the success or failure of a particular hand, as the player might have the benefit of acting last in a hand, therefore knowing what his opponent has done. To evaluate how you play in each position in relation to the dealer button, the most important statistic in PokerTracker to look at is VP$IP, which stands for Voluntarily Put Money Into the Pot. Simply stated, VP$IP states how loose or tight a player is. Ideally a player will be tighter farther away from the button, and looser as he gets closer or onto the button. If the VP$IP, which is a percentage, goes down when farther from the button it indicates that the player is playing tighter in early position. Conversely if the number goes up when a player is closer to the button, he is loosening up his starting hand requirements and drawing to more hands because he knows what more players have done in front of him. The other important positions to evaluate position from are the blinds. VP$IP will only reflect play from the blinds if a raise is called or a player raises himself, because otherwise the play would not be "voluntary." The other most important way PokerTracker helps a player is by giving him information on the play of his opponents. He can gather that information on his opponents by collecting data on them from hand he played against them, or if that player is using Party Poker or a Party Poker Skin, by tables he was observing. Especially useful in analyzing the play of your opponents, is the "Auto Rate" function of PokerTracker. To use the "Auto Rate" function, you first must set up rules for evaluating players. We need to know if a player is loose or tight, and we need to know if that same player is passive or aggressive. A loose player is one who will enter a hand with worse cards, and a tight player is the opposite, only playing very good cards, especially when there is a raise involved. An aggressive player is more likely to raise with poorer hands than a passive player. Looseness or Tightness is evaluated best in PokerTracker by using VP$IP. A person who has a VP$IP of 20% or lower is an extremely tight player, playing only the very best hands pre-flop. A player that has a VP$IP around 30% is neither loose nor tight. A player that has a VP$IP of 50% or higher is an extremely loose player. Now that you can evaluate how tight or loose a player is using his VP$IP, you can evaluate how aggressive or passive he is by looking at his Aggression Factor. Aggression Factor is determined by a players raise percentage plus his bet percentage divided by his call percentage. If a player bets and raises a lot compared to the number of times he lets someone else do the betting and just calls, he will be represented as a very aggressive player. If a player's aggression factor is below 1, he is a passive player. If his aggression factor is above 1.5, he is an aggressive player. 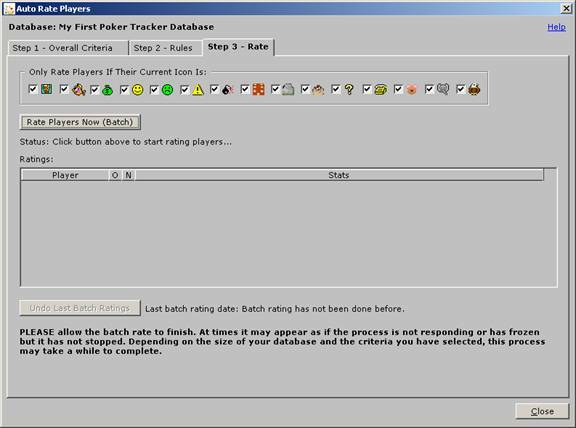 Using these rules, we can set up the "Auto Rate" feature in PokerTracker. Close all statistics windows and click on "Utilities" then "Auto Rate Players" in the menu bar. The first tab, "Overall Criteria" is self-explanatory. It eliminates hands in the history that might give the wrong information, like short-handed games, players that don't have enough games or really old games. The second tab "Rules" is the place where you add our loose/tight and aggressive/passive rules into the software. Double click the Icon you want to use to represent each of the five possible entries. Pick one for Loose-Passive, one for Loose-Aggressive, one for Tight-Passive, one for Tight-Aggressive and one for everyone else. Select the statistic you want to evaluate for each one. Each should have two stats, based on their characteristics. All that's left to do is let PokerTracker go through the database and rate the players that are already in the database. Click on "Rate" and let it go. There are a lot more possibilities and categories you can add to improve the ratings on your players. Tightness and aggressiveness are only the beginning. You don't have to use only data from games that you've played in to collect data on your opponents. By observing many tables for long periods of time, a competitive advantage can be gained on possible opponents by analyzing their play before the player has even sat at a table with him. Now that you have your players rated, you can use PokerTracker while you are playing to help you make decisions based on your information. For that you can use the "Game Time" window. In order for the "Game Time" window to keep up with the current game window, you must configure the "Auto Import Hand Histories" function. When you select the "Populate the Table with information from previously loaded sessions" in the pull down menu the "Game Time" window will be populated with information from all the players seated at your table. The "Game Time" window gives only the most critical information about a player. Players who have won money will have statistics in Green. Those that have lost money will appear in Red. Statistics included are VP$IP, Pre-Flop Raise percentage, Big Bets per 100 hands won or lost, and number of hands in the Poker Tracker database. The players are listed in the table at the bottom of the "Game Time" window. Double clicking the players name in the table will bring you to the "General Info" tab of Poker Tracker for that player, giving additional information about him. 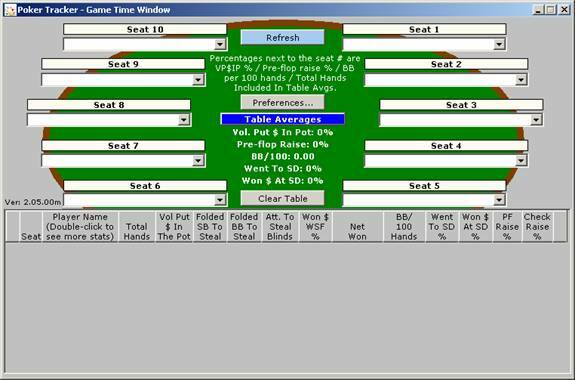 There are free add-on options such as "Player View" and "Game Time Plus" that allow you to put the "Game Time" data directly on the screen of certain poker software , making the "Game Time" function even easier to use. Another way to use information on your opponents is to take notes on your opponents based on your collected data and transfer that data directly into the note taking functions of Party Poker with skins, Full Tilt Poker , PokerStars , or Absolute Poker . First you should export your existing notes from the poker software you are using into PokerTracker, so that you don't lose notes you have already taken. You can then add your Auto Rate generated notes into your notes and import them back into your poker software. Of course, now that you've classified your opponents, the tricky part is how to adjust your play to beat them. But that's a completely different guide.